How is everyone coming with their December challenge? So far I am 2 for 2! This morning I had to set the alarm for 6 am to make sure I got my extra 15 minutes in. Ugh. It was awful. Tomorrow I have to be at the dentist early, so I’ll have another early wakeup to get my extra 15 minutes in. 1pm, … when all the crazy lunch swimmers are out of the pool and I get my own lane 🙂 … a must! Agreed. Your own lane is critical. Happy swimming! 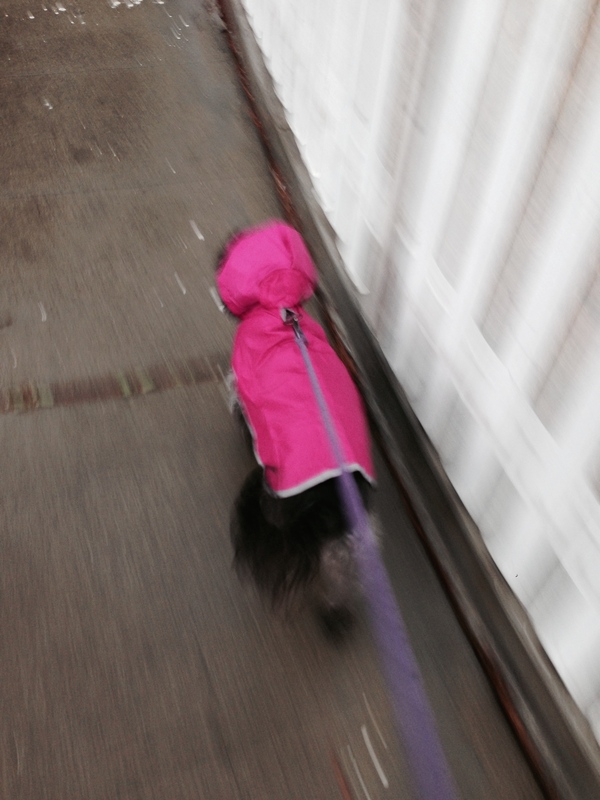 Poet looks absolutely adorable in her raincoat. So glad she’s getting to wear it. I don’t know about this extra 15 minutes thing, but I have made it to the gym every day this month so far. I have to go on my way home from work. I just can’t work out at 5 a.m.
Good job on getting to the gym! I think that fits the challenge. Just keep it up throughout the month. 5 am. Only the criminally insane get up at that time. Previous Previous post: December Challenge!